Errr, I went to college to study Photography in 1982 at Richmond upon Thames, and did some freelance work for the Surrey Advertiser , and became good friends with Paul Sherwood (one of their staffers) who was dating a girl that I fancied (whoops to much information). My dad was a photographer during his national service and got me interested in photography as a hobby and then I did a couple of weeks work experience with The Southern News Service (Cassidy and Leigh) during which I decided this IS what I want to do for a living . However after a falling-out with the Surrey Advertiser and finishing college I struggled to get an opening on Fleet Street, it was a closed shop, you had to sacrifice a goat, be a member of the NUJ, and be introduced by a third cousin who had a wooden leg, was a member of the freemasons, and sign in blood, needless to say I couldn’t get in (they found out my third cousin’s prosthetic limb was fibreglass). In those days the equipment we used was very diferent from the kit that I (and my professional colleagues) carry today. My first Pro Kit consisted of: a pair of Canon A1 bodies with MA sets, a pair of F1n Bodies with FN Drives, Canon FD17mmF4, 24mmF2, 50mmF1.4, 85mmF1.8, 100mmF2.8, 200mm F2.8, a monster Metz 402 Flash, Speedlite 199a, to which I added (or replaced something with) a 24mm-35mm F3.5L, 70-200mmF4, Metz 60 CT1 (which I still use) all piled in to a Billingham Bag (or if travelling light a Tenba P211). I did manage some freelance assignments but it was hard work and poorly paid. After a lot of soul searching I decided that I would try to earn a living another way. Besides my mother was fed up with me under her feet all day and said ” Get a proper job” not in so many words of course. So I went to work for a PR Photographers for a while but didn’t enjoy it. I decided that I wasn’t going to stay in a job that I hated, and started planning my “great escape”, I amassed a large amount of photographic equipment, everything I thought I would need except for the Digital Cameras (which were then over £15,000 each). My initial 35mm outfit (for those that haven’t yet lost the will to live) consisted of: Canon EOS 3, Canon EOS 5, Canon EF 20-35mm F2.8L, Canon 28-80 F2.8/4L, Canon 80-200 F2.8L, Canon 540 EZ (2x), Canon TPE 2 (Flashgun Battery pack), plus countless other bits (studio lights, meters, etc). Initially I worked for The Southern News Service, also known as Cassidy and Leigh (as it is run by Denis Cassidy and Don Leigh) which was a trying time. Mind you as a journalist they would be tough to work for as well. I was on a job in Croydon and Denis (very particular about the one ‘n’) called to tell me to go to Farnham for another job, when I called later to tell him that I was stuck in a traffic jam, and it would probably take an hour longer than expected to get their, boy did he swear “I could f*%$ing walk there quicker than that, F*%$ing hopeless……” at which point I hung up, nobody speaks to me like that. Don Leigh called back twenty minutes later to apologise. Working with Denis and Don was a great learning experience but not very pleasant or well paid, however I learned a great deal, (mainly that I didn’t ever want to work for anyone else again). We sold the house that we loved and rented a flat which meant that I could afford to start up, and live for 2-3 years with little or no income . 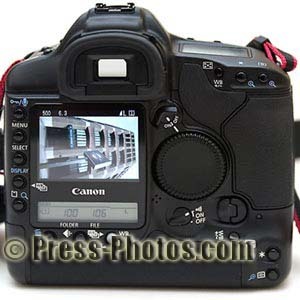 I purchased the Digital SLR’s that I needed, initially a Kodak DCS3, a 1.3 megapixel Canon EOS1n. 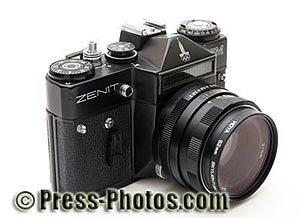 Later followed a pair of Kodak Canon DCS520’s (same as the Canon D2000) a 2 megapixel SLR, again based on the EOS1N. 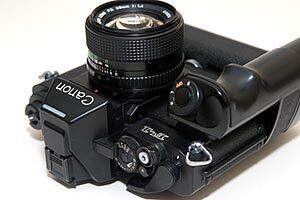 Then in the early part of 2002 we started replacing all of our equipment, with a pair of EOS1D’s, EOS1VHS, All new Canon ‘L’ glass. In 2003 we replaced our laptops, desk-based machines and upgraded printers to Canon S9000. To say that “everything else is history” would be underselling the amount of work required over the last few years. To bring it right up to date, Press-Photos.com is now a well established agency providing enough work for three full-time photographers, providing myself a reasonable income (not quite enough as I would like, but then……). We supply all the national newspapers with images and stories from the south of England and London and our future expansion plans are…… well secret at the moment. However check back here again because “this time next year we’ll all be millionaires Rodney”. Well probably not, but we can dream!! Do you have any idea who owns that image archive now?